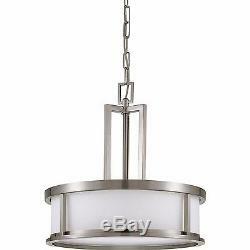 Glomar Andria Glamor 4-Bulb Brushed Nickel Hanging Pendant Light Ceiling Fixture. The cornerstone of the Adria Collection is quality, and this pendant is no exception. Combining a traditional brushed nickel finish and posh styling, you will find no better way to highlight the charm of your home. With the superb craftsmanship and affordable price this fixture is sure to tastefully indulge your extravagant side. Equipped with satin white glass. Compatible with any medium base, LED, CFL, halogen or incandescent bulbs 100-Watt or less. Easy installation instructions and template enclosed for convenient setup. UL rated for dry locations. Recommended Light Bulb Shape Code. We do not accept P.
BOXES -PLEASE PROVIDE A PHYSICAL ADDRESS. &###xA0; Because Of The Efficient Manner Of Our Ordering System, Orders Placed Cannot Be Canceled An Hour After They Are Made. These products are manufactured according to the specifications of the US Electrical Standards and codes. We assume no responsibility if the item malfunctions or causes an accident because you tried to use the product with foreign electrical standards. The Use with a converter or other voltage transforming device is at your own Risk. We guarantee that your issue will be solved quickly. I&###xA0;usually respond within 12&###xA0;hours or less. Glomar Andria Glamor 4-Bulb Brushed Nickel Hanging Pendant Light Ceiling Fixture Product Overview The cornerstone of the Adria Collection is quality, and this pendant is no exception. 17 Details Adjustable Lamp Head No Light Bulb Base Code Medium Adjustable hanging length Yes Light Bulb Type Included No Bulbs Included Chandelier/Pendant Type Drum Maximum Bulb Wattage 100 Connection Type Hardwired Maximum Wattage (watts) 400 Fixture Color/Finish Brushed Nickel Number of Bulbs Required 4 Fixture Color/Finish Family Nickel Product Weight lb. The item "Glomar Andria Glamor 4-Bulb Brushed Nickel Hanging Pendant Light Ceiling Fixture" is in sale since Wednesday, July 5, 2017. This item is in the category "Home & Garden\Lamps, Lighting & Ceiling Fans\Chandeliers & Ceiling Fixtures". The seller is "beyondhomeimprovement" and is located in Las Vegas, Nevada.